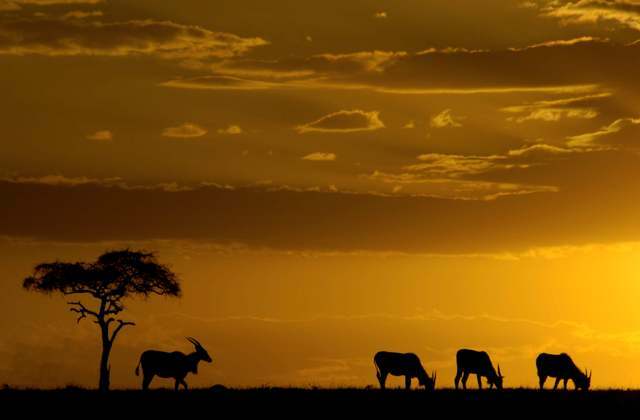 The golden hours around sunrise and sunset are the busiest for both the animals of the Maasai Mara and for the photographers who follow them. An African safari is certainly not the ideal option for late-risers. I wake before first light and grab a quick coffee and a handful of hot cookies on my way out to the Landrover. We’re already out on the Aitong Plains when the first light begins to fade the eastern horizon. Much of the Maasai Mara plateau is over 2,000 metres high and in an open vehicle I’ll keep my thick fleece zipped up to my chin until the first rays of that blessed Kenyan sun reach me. This close to the equator the light changes very quickly and if you don’t have the perfect vantage-point sussed out in advance you are very likely to miss that all-important ten-minute window of saturated sunlight… or to bypass the crucial hunting grounds. It might be early but you never feel more awake than during the hunting hours in the African bush. I keep my eyes and ears open for hints of the life and death dramas that were played out during the night. The nomad lion that we heard roaring around midnight has almost certainly left his pugmarks somewhere across this dirt-track. The Thomson’s gazelles that are pronking happily on the plain may well have had a nocturnal run-in with the big male leopard that was coughing near here yesterday evening. My Maasai guide stops to look for signs of nervousness among a herd of eland. They are often strangely timid for such huge antelope but a stamping hoof or a pair of tensed ears could be a sign that the local pride is still on the hunt. Boniface Ole Mpario is the head guide at Kicheche Mara Camp and one of the best wilderness guides in Kenya. While he stands up to scan the plains with his binoculars I stay seated. I’ve already learned that what Boniface doesn’t spot is not worth spotting. Kicheche is a tented camp, a few miles outside the northern boundary of the Maasai Mara reserve. The Mara is far too immense ever to be fenced and the animals roam at will. By staying on the private concession like this, rather than at one of the camps in the Mara itself, I can avoid the restrictions of the reserve. Two nights ago Boniface and I saw the Kicheche pride, one of the largest in this part of Kenya, make a kill that we would never have witnessed had we been forced by park regulations to return by sunset. Yesterday we tracked buffalo on foot, with an armed guard, and walked among peacefully grazing white rhino. This morning we are driving through herds of zebra, wildebeest, hartebeest and giraffe and we will be among the great elephant herds, deep in the heart of the Mara, before the sun is high. We are driving through the greatest wildlife real-estate on earth and can expect some wonderful sightings and, with luck, a few good photos before the mid-morning sun drives the animals in search of shade…and us in search of a couple of frosted bottles of Tusker.